The beginning of the new school season churns out interesting data, revealing that the ABA and BCBA fraternity of America is more inclined than ever to use mobile apps – co-developed by Rangam Consultants, Inc. and WebTeam Corporation – to deliver effective autism intervention. Over 5 years' of efforts with leaders from autism community and special education have led to the development of this innovative, technology-driven model for a fraction of the cost of traditional autism intervention. 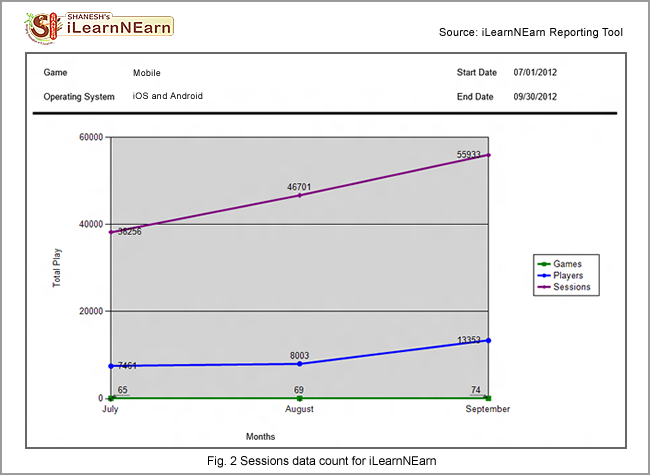 Latest figures unveil that the iLearnNEarn app series – a special needs education model developed by WebTeam Corporation and Rangam Consultants, Inc. for children with autism – has been enjoying a discernible presence on the apps download chart on iTunes since September 4, the opening day of the new school year. Picture speaks a thousand words, Fig. 1 on the right does paint two diametrically opposite ‘landscapes’ – one resembling the plains (up to 08/26) and the other a hilly terrain (08/26 onward, shaded in light green). Can we call it a mere coincidence that the number of downloads had been moderate for the better part of August before peaking a tad on the first 3 days of September and then registering a drastic upswing from September 4? We guess not. On the inaugural day of this year’s school season, the download count hovered around 1,900+ and by the end of the first week, it shot up to 2,900 and above. Fig. 2 displaying the number of sessions played in iOS and Android also suggests that users paid more visits in September, in comparison with July and August. The blue line indicating the number of players also bent upward near the onset of the fall season. A clear pattern emerges from the data given by WebTeam Corporation and its sister concern, RCI. Teachers and professionals are not hesitant to take recourse to a different method to see whether or not it consolidates special needs education. At the moment the US Department of Health & Human Services enlists 9 commonly adopted intervention approaches to treat children with autism. They are auditory training, discrete trial training, vitamin therapy, anti-yeast therapy, facilitated communication, music therapy, occupational therapy, physical therapy, and sensory integration. Shanesh’s apps are developed on the discrete trial part of applied behavior analysis – an evidence-based early intervention approach widely considered to be among the best available practices. Since apps cannot replace mainstream autism treatment, asking people to pay an insane amount of money to import some ‘fancy icons’ to their iPad and Android devices is a recipe for disaster. WebTeam Corporation and Rangam have thus far knitted a decent pricing strategy to ensure the cost does not scare people away. For a majority of the apps in the iLearnNEarn series, there are 2 different slabs to pick and choose from – Lite and Paid. iAssessNTeach - based on Eden Autism Services' special needs education curriculum for infants and school age children - has an affordable pricing range that allows school authorities to deliver individualized education to a number of students at a time. The 6-student license for iAssessNTeach comes at a nominal $9.99 for 30 days. It seems reasonable considering the struggle parents and teachers face to secure the funding allocated for special education. Let’s not also forget the bigger question marks lurking over evaluation, planning, intervention delivery and timely re-evaluation at the turn of the next school season. So it is all too soon to cast a prediction on what the new academic year holds in store for America’s special needs pupils. Nevertheless, there is little doubt that the app revolution – fueled by a mercurial increase in the number of iPad and iPhone users since 2010 – has had a truly choice-altering impact on our special education domain. "The Shanesh project started with a small summer assignment for young children after a lot of research and development. We worked closely with subject matter experts and developed the kiosk-based, patent pending COLORS Program for children with autism. But once we recognized that the kiosk-based model is not capable of delivering intense intervention globally, we decided to make apps that people can run conveniently on mobile devices – anytime, anywhere. At the moment we have about 70 odd apps and the number is increasing gradually. We have had more than 100,000 downloads over the last 6 months. But apps are not the only thing on our mind. Our long-term goal is to make autism intervention not just cost-effective, but more oriented at helping an individual lead a life of reasonable independence," summarized Nish Parikh, CEO of WebTeam Corporation, Vice President of RCI and chief architect of Shanesh COLORS Program that began its journey last year. “We all had been waiting for this day,” said K J Sharma, senior adviser to WebTeam Corporation and a key figure behind the conceptualization and development of Shanesh’s autism apps. “The recent spike in the number of downloads clearly points out that teachers in particular have an open mind to try our apps in conjunction with whatever methods of intervention they prefer,” Sharma added. Tiffany Bridges, mother of a 6-year-old autistic boy and also the owner of a parenting group based in Springfield, Illinois, said in an email interview that she has “no qualms rating the iLearnNEarn series of apps higher than many similar apps” that have recently featured on iTunes and Google Play. “My son is in love with Shanesh characters and throws a tantrum when he is asked to leave the iPad,” Bridges added with a laugh. 55,000+ sessions were played in SeptemberThe graphs show a big leap in activities in September 2012. Compared to August, the number of players also increased by more than 5,000. 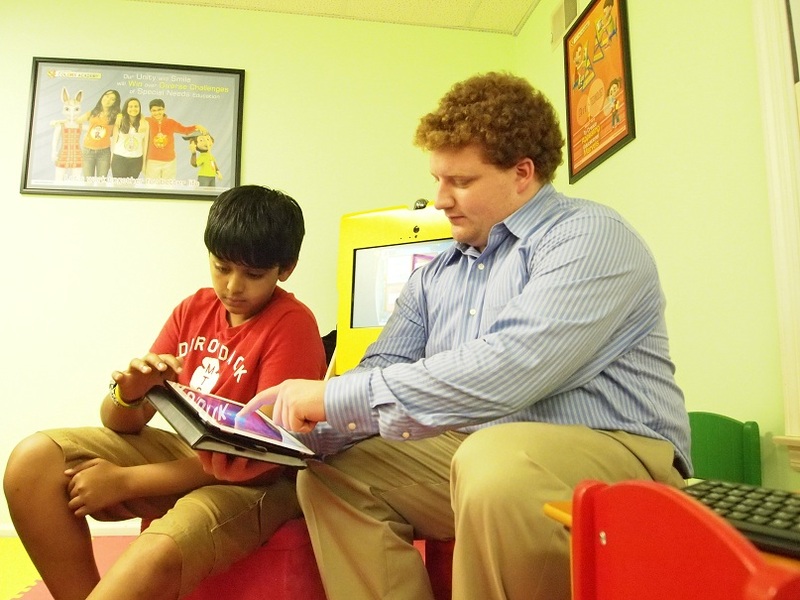 Shanesh started its kiosk-based autism intervention in 2011Nish Parikh is at the kiosk at COLORS Academy in Raritan, NJ, with Sahil Patel (7) and Nishali Parikh (15). Nish Parikh at the kiosk at COLORS Academy, Raritan, NJNish Parikh testing iPad apps at COLORS Academy, Raritan, NJ Nived Parikh, Age 13, Tim Sharp, COLORS Project CoordinatorNived Parikh testing apps developed by WebTeam Corporation at COLORS Academy for Autism at Raritan, NJ WHO WE ARERCI and WTC are sister concerns that have joined hands to make a positive difference in healthcare, education, and employment sectors. To ensure excellence in everything we do, we work not just together, but also with industry leaders.